Learn how to prepare, produce, and deliver webinars that build enthusiasm among your target prospects. Find out what mistakes companies often make in their marketing webinars and discover easy ways to avoid them. Enjoy greater responsiveness and participation by your prospects, leading to easier sales communications and higher conversion percentages. 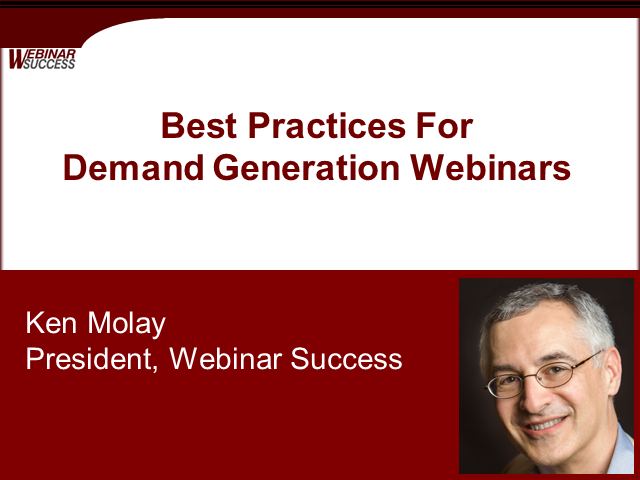 This session is appropriate for producers and presenters of demand generation webinars. It is valuable for those currently using webinars in their business and for those just getting started with webinars as a new marketing channel. A live question and answer session will let you guide the session to concentrate on topics of the most interest and benefit to you.